One for the super-fans. Yes, you could be a lucky star if you’re one of the winners of our latest competition here on the site! 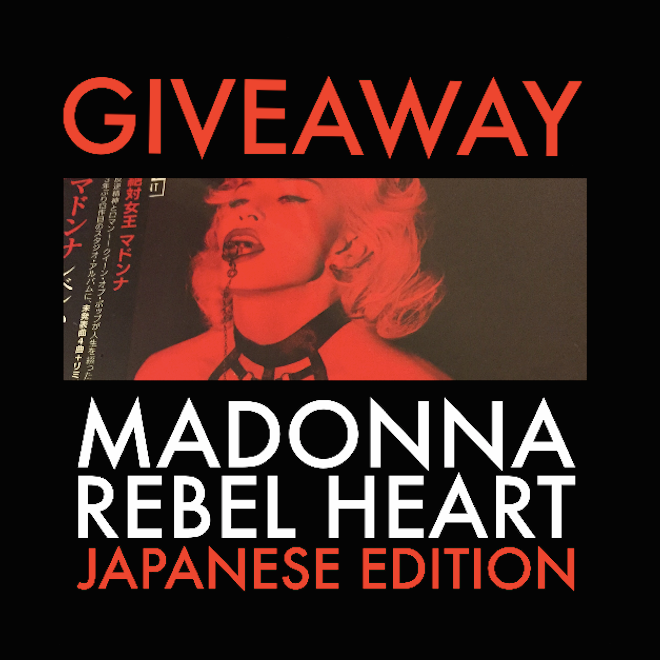 Yes, we recently returned from a sneaky little pre-winter sojourn to Japan where, with you our dedicated readers fresh in our minds, we couldn’t help but venture into the nearest branch of Tower Records and pick up three copies of the super-deluxe Japanese edition of Madonna’s latest album ‘Rebel Heart’. Being big a Madonna fan, you’ll no doubt be aware that the super-deluxe version of ‘Rebel Heart’ wasn’t given a release here in Australia. You’ll no doubt also be aware that Japan got an extra track on the album – the Dirty Pop remix of ‘Living For Love’. And you’ll also no doubt be aware that these are hard to come by here in Australia. SO… with our very own hard-earned, we nabbed three copies of this baby to give to you. Each copy comprises 26 tracks in all across two CDs, all housed in a digipak with unique sleeve artwork, shrink-wrapped for freshness and complete with Japanese OBI strip. Collectors be moist. THIS is our contact page. You’ll want to go there to enter this competition. In the subject box, place the term ‘Mad For Madonna’ and in the comment box, tell us your favourite ever Madonna song and why. Don’t forget to place your postal address in there too, so we can pop a copy in the mail if you win!